December is here, which means the holiday season is upon us. Time for cookies! And cocktails. Or better yet, cookies with cocktails. If that combo sounds odd, you need to try the Frostbite Cocktail. This drink is full of rich cream and chocolatey crème de cacao. So it fits right in with holiday baked goodies. The surprise ingredient in this cocktail is tequila, a tough-guy liquor that few associate with dessert. But in the Frostbite, sweet cream mellows the bite of tequila—and chocolate turns it into Santa’s little helper. So mix up a round of these for some festive cheer. Then raid the cookie jar. 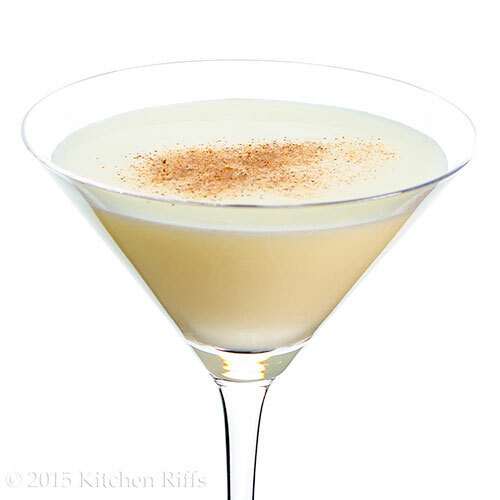 The Frostbite is essentially a tequila version of the Brandy Alexander Cocktail. But the Frostbite’s flavor is a bit sharper and brighter. We found this drink while reading Robert Hess’s website. So of course we had to try it (and we’re glad we did). This cocktail takes about 5 minutes to make, and serves one. Add all ingredients (except garnish) to a cocktail shaker half-filled with ice. Shake hard for at least 30 seconds (to chill the ingredients and allow the cream to froth). Strain into a cocktail glass (preferably once that’s been chilled). Garnish with a sprinkling of nutmeg or cinnamon, if desired, and serve. The Frostbite Cocktail is perfect for snowy weather! Although we suppose you could serve the Frostbite as a before-dinner drink, we wouldn’t recommend it. Given its sweet flavor, we think it works better as an afternoon treat (preferably with cookies) or as an after-dinner drink. This recipe makes a fairly small drink by modern standards—about 3 ounces (including the water you add from melting ice when mixing the drink). You can double the recipe if you wish. But we’d elect to mix a second round if we wanted more—freshly made cocktails taste brighter than ones that have sat in the glass too long. If you find the tequila flavor too strong in this drink, just reduce the amount to ¾ ounce. Tequila is made from the agave plant (a kind of cactus), and the better ones are 100% agave. Cheaper tequilas are made with 51% agave (sugars are added in fermentation). Fermenting alcohol out of sugars isn’t unusual—that’s how rum is made, for example. But in the case of tequila, adding sugars results in a somewhat inferior liquor. Tequila is sold in four different aging categories: blanco, reposado, añejo, and extra añejo. Blanco (white) tequila is aged for up to 60 days. Its color makes it ideal for this drink. Reposado (which can be aged up to a year) has more flavor. But because it’s aged in oak barrels, reposado takes on a brownish color. Which means it won’t look as nice in a Frostbite. Añejo tequila is aged up to 3 years (also in oak barrels). Extra añejo is aged even longer (again, oak barrels). Both are very fine tequilas, but they can be expensive. Using them in this cocktail would be overkill, in our opinion. 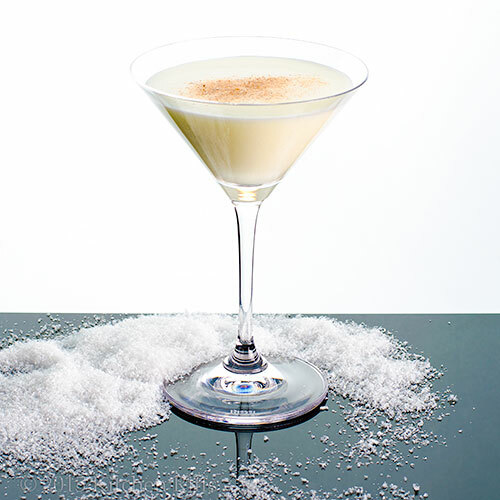 So when making a Frostbite, we suggest using any good-quality blanco or reposado tequila (blanco is our choice). If you’re looking for a brand suggestion, just ask at the local liquor store. Crème de cacao is bottled in both white (clear) and brown versions. The flavor difference between them is very slight; when mixed in this cocktail, it’s hard to distinguish between the two. We prefer to use the white version in a Frostbite because we think it looks more attractive (the brown version will produce a slightly darker drink). But if you have brown crème de cacao on hand, but all means use it—no need to buy white just for this drink. You can find crème de cacao at every liquor store (in the section that contains liqueurs and cordials). Several inexpensive brands are available at around $10 or so per bottle. The two brands we see most often are DeKuyper and Hiram Walker. Either works fine in this drink. If you want to splurge, Marie Brizard offers a good step up in quality (but it costs at least twice as much). Some versions of the Frostbite add blue curaçao (an orange-flavored liqueur). This adds an attractive hue to the drink, but detracts from the flavor. We say skip it. If you’re using nutmeg as a garnish, we recommend buying whole nutmeg seeds, then grating them as needed (we use a microplane grater). Freshly ground nutmeg tastes way better than the pre-grated stuff. “Never knew tequila could play so nice,” said Mrs. Kitchen Riffs, sipping her Frostbite Cocktail. “Almost as smooth as the Brandy Alexander,” I said. Looks so festive! I am thinking about subbing eggnog for heavy cream. Do you think it would dominate the flavor too much? Can I have one cookie and raid the frostbit jar instead? Sounds just amazing and I am a fan of tequila so it does not scare me away! Thanks for the holiday Cheer! Now this is one that I want to drink! What a delicious drink this one must be. The name, "Frostbite Cocktail" is a perfect drink to serve at holiday time..It looks so festive and I love the idea of adding a sprinkle of nutmeg or cinnamon for garnish. It really looks so yummy. Love your notes and of course your banter with Mrs. K Riffs..I like how you incorporated the different drinks in your conversation. Great job! Have a wonderful day and a great rest of the week..
Oh, yes! This is my kind of cocktail, one would not be enough! Hi ilke, interesting idea! It might dominate, but it's definitely worth a try. And if it's good, you'll have invented a new drink! :-) Thanks for the comment. Hi Evelyne, raiding the jar sounds like a great idea! :-) If you're a tequila fan, this is definitely worth a try. Thanks for the comment. Hi Dottie, this drink is so much fun! And doesn't taste all that boozy. Thanks for the comment. Hi Pat, the flavor of this is so interesting -- the tequila adds some fun zing. :-) Thanks for the comment. Hi Dana, we had a great Thanksgiving! Had one or two of these that weekend, actually. :-) Thanks for the comment. What a delicious drink... and perfect for the season! Looks stunning! It is like a dessert cocktail. Great for the season, right? Typically I prefer to avoid frostbite, but I'll have to make an exception for this :) Sounds like a nice treat. 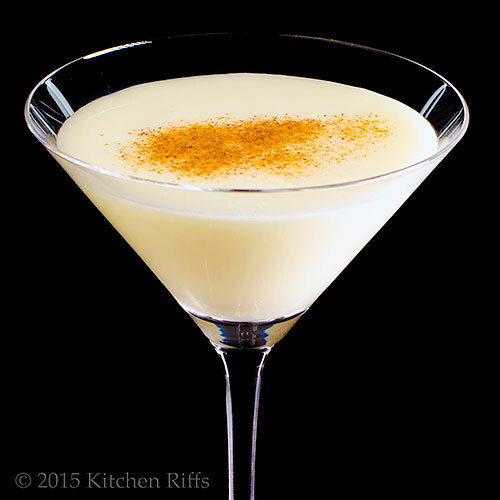 You had me at Brandy Alexander! Hi Denise, isn't this a good one? And so seasonal! Thanks for the comment. Hi Tricia, this is really a pretty one! Not to mention tasty. :-) Thanks for the comment. Hi GIGI, yup, this is the kind of frost bite I enjoy. ;-) Thanks for the comment. Hi Holly, this is really perfect for when you want to drink your dessert. :-) Thanks for the comment. Hi Laura, I know how much you hate cold, wintry weather. But this is winter in a glass -- a different sort of thing entirely. :-) Thanks for the comment. Hi Nee nutmeg and black pepper really do need to be freshly ground, don't they? So much more flavor and fragrance! Thanks for the comment. Hi Liz, the Brandy Alexander is a wonderful drink, isn't it? This is certainly similar, but the tequila adds a different dimension. Thanks for the comment. Mmmmm! Looks like a perfect dessert drink! It will surely warm someone up on a cold winter day! Hi John, always learn something new, this drink sounds delicious! My kind of drink :-) Looks so perfect and delicious! This look so delicious!! As dangerous as it is, I kind of like my cocktails with a bit of Tequila kick! Thanks for the drink, I can't wait to give it a try! Yum this sounds like a malt. I'd probably down a few of these and then get up to go someplace and fall down. I can see this going down very easy! Perfect after dinner celebratory drink---though I don't think I'd be able to wait for a celebration!!! Mrs. KR is right - "too many drinks" but we're just getting started with the holidays. YAY! We're headed to the liquor store on Friday and I have a list so I can try some of your wonderful beverages. The creme de caco in this drink sounds wonderful and I already have the tequilla. The problem I see with this drink is yes, it's going to go down way too easy. thanks John for more temptation! Hi Melanie, we like this drink best of all for dessert. Or with cookies. :-) Thanks for the comment. Hi Cheri, there are loads of drinks out there. Loads. :-) Always a new one to try! Thanks for the comment. Hi Kushi, it's really a great drink -- good flavor, good looks. :-) Thanks for the comment. Hi Julie, tequila is good stuff, isn't it? And really works in this drink. Thanks for the comment. Hi VIcki, doesn't have the malt flavor (the tequila replaces that), but otherwise it is rather similar! An adult malt. :-) Thanks for the comment. Hi Liz, Wednesday is hump day -- enough reason to celebrate for me! :-) Thanks for the comment. Hi MJ, it's fun to go to a liquor store with a list! And you're right -- this drink goes down very easily. Too easily. :-) Thanks for the comment. Hi Maureen, LOVE the idea of this as a frozen drink! May need to work on a summer version. Unless you beat me to it! :-) Thanks for the comment. Frostbite!!! what a name :) I bet Santa will be thrilled to have this drink ... might even help him complete his journey in this freezing weather. For me I'll just stick with the cookies and leave the drink to Santa. You two have too much fun and you make it such pretty fun. Who wouldn't love this for a snack or dessert, it sounds amazing. Hi Charlie, that snow shot was fun! Messy, though. :-) This would be a great Christmas Eve drink! Thanks for the comment. Hi Amira, Santa would thank you! And happily leave the cookies to you. :-) Thanks for the comment. Hi Chris, it's a fun drink! Tasty, too -- our favorite kind. :-) Thanks for the comment. Another fantastic Kitchen Riffs cocktail! I agree that this would be the perfect after-dinner drink. But with cookies would be an indulgent treat on a snowy day as well! Gorgeous photos as always, John! Hi Pam, isn't this nice? And yes, it goes down easy peasey. :-) Thanks for the comment. Hi Kristy, we actually like this best with cookies, although it's really good for an after-dinner treat, too. Thanks for the comment. Hi Marcelle, this would be a wonderful drink for a Christmas party. With cookies, of course. :-) Thanks for the comment. The perfect winter sip! Creamy and boozy -- it would be a hit at any cocktail party. Hi Marta, it is, isn't it? :-) Thanks for the comment. Hi Carolyn, it's a really yummy drink -- excellent flavor. And you're right -- great at a cocktail party. Preferably one that serves cookies. :-) Thanks for the comment. Santa's little helper indeed! Great cocktail, John. Hi Debra, elves everywhere love this drink. :D Thanks for the comment. hehe--st. nick is so lucky at your place. Such great treat options for him!! Hi Ala, St. Nick definitely loves visiting us! :-) Thanks for the comment. Hi Greg, certainly a lost faster and easier to make! Thanks for the comment. Hi Pamela, this drink definitely calls for getting frostbitten! Love that line. :-) Thanks for the comment. I absolutely adore creamy cocktail and this is simply stunning. I love the name and how fab it looks. I could drink a few, so tempting. Thanks for sharing a snow white forstbite Christmas cocktail, it's perfect for this time of the year. Hi Asha, this really is so seasonal, isn't it? And very tempting! Not to mention smooth and flavorful. :-) Thanks for the comment. beeeutiful. And perfect for one (or all) of my upcoming holiday gatherings. Pinned. Hi Lea Ann, great holiday drink, isn't it? Pretty and tasty! Thanks for the comment. Well December is my birthday month so I know what I'm requesting. I love chocolate, Manservant loves tequila and who doesn't love heavy cream? Frostbite is looking mighty fine! Hi Abbe, you and the Manservant will love this! December is Mrs KR's birthday month, too! Thanks for the comment. Hi Yung, isn't this pretty? Tasty, too! Thanks for the comment. I can't imagine a lot of cocktails being matched with cookies, but this one sounds like it would be perfect. And I love the name - I think Santa would like this one, too! Hi Beth, definitely not a typical pairing! But with this drink, a nice one. :-) Thanks for the comment. After a couple -- read few -- of these, I doubt I'd be worrying much about cookies. Never heard of mixing tequila with dairy but I can see where it would be tamed a bit this way. And you're so right about freshly grated nutmeg. Once I "discovered" it for my own cooking, I tossed out all of the pre-ground. There's just no going back. Thanks, John, for sharing another great cocktail. Hi John, we thought the tequila and cream combo was a bit weird too, at first. But then we tried it, and wow! Good stuff. :-) Thanks for the comment. 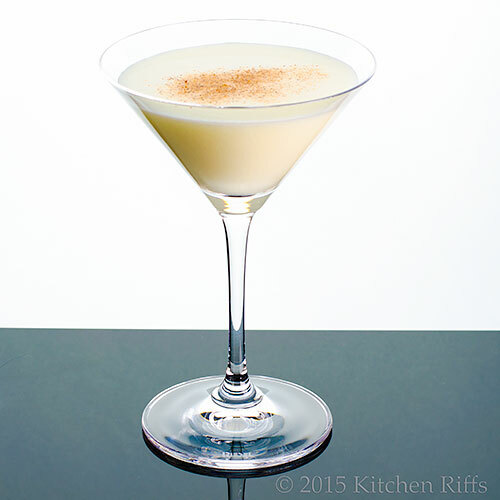 I have always loved Brandy Alexanders -- but that was before I needed to watch my weight! This is a tempting treat, but, I must admit, Mlk Punch is calling to me, too! Yuuuuummm! I love this festive drink! So perfect for the holidays! Hi Rosemary, alas, the cream-based drinks do add a lot of calories. Bummer. But they taste so good! The Milk Punch is a tasty drink -- you'd like it. And the Frostbite, too. :-) Thanks for the comment. Hi Amy, this really is so festive. And terrific flavor! Thanks for the comment. I'll be busy with moving and probably won't get much holiday baking done this year--but a cocktail or two is very doable! Love the sound of this one with tequila. Hi Lisa, moving is such a pain, isn't it? You need one of these as an antidote! :-) Thanks for the comment. Hi Ashley, we crave this type of frostbite too! :-) Thanks for the comment. What an appropriate cocktail for this time of year, sounds delicious! Hi Raymund, looks definitely are deceiving when it comes to this drink! Thanks for the comment. Hi Caroline, isn't this so seasonal? And so delish! Thanks for the comment. Hi Taruna, we didn't drink cocktails for ages -- just were interested in their history. And great good looks! Obviously we drink them now, but always keep the cookie jar full for those who don't. :-) Thanks for the comment. Hi Marcela it is indeed very addictive. And tasty. :-) Thanks for the comment. Hi Zoe, we try to limit our cocktails to the weekend! We'd be useless otherwise. :-) Thanks for your comment. I assume that's fake snow in your photo- probably not snowing yet in St Louis? Interesting information about tequila- I didn't know there were so many different types of tequila! Another wonderful cocktail. Sounds delicious and looks wonderful. I could see myself enjoying a few of these over the holidays! Hi Fran, fake snow. :-) We haven't had snow yet, but it does happen sometimes by this time. Thanks for the comment. Hi Dawn, this is a good holiday drink! Very festive. :-) Thanks for the comment. That has got all the ingredients that make a real cocktail for me. The minute you put cream in, then it's mine. I am a real glutton for cream. Hi Suzanne, cream is such luscious stuff, isn't it? Love its texture! And flavor. :-) Thanks for the comment. Hi Rosita, isn't this nice. And you're right -- so nice for Christmas. Thanks for the comment.